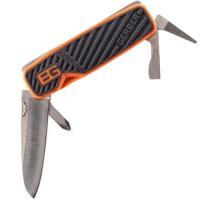 Carry the essentials in your pocket with the Gerber Bear Grylls Pocket Tool. Designed for everyday carry, this compact multi-tool features a set of basic tools and can be carried comfortably in your pants pocket. A thicker, rugged handle and stainless steel construction gives the Pocket Tool a nice sturdy feel while a rubberized exterior provides a stable grip, even with gloved hands. The five-component design covers all the basics, including a fine-edged blade, a bottle opener, small and medium flathead drivers, as well as a Phillips head driver. Built with your needs in mind, a thumb notch allows for easy one-handed opening. As an added bonus, Gerber includes the Bear Grylls Priorities of Survival Guide to ensure you get the most out of this exceptional multi-tool.